Browse > Home / Appearances, KJNi-LP 101.7 FM / Meet the Voice of JENNiRADIO! Meet the Voice of JENNiRADIO! This Labor Day weekend, meet Jennifer Smart, the voice of JENNiRADIO. You hear her every day on 101.7 KJNi in Southern California, as well as JENNiRADIO.com. 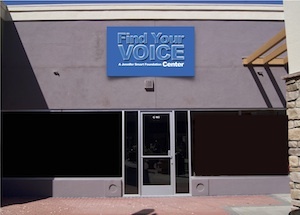 Come by the Outlets at Lake Elsinore, and Jennifer will give you a tour of the new Find Your Voice Center. We’ve got cold beverages and snacks for sale, including freshly made popcorn. And don’t forget to get your raffle tickets – we’ve got a guitar signed by “Weird Al” Yankovic, Olivia Holt and other stars. Tickets are just $5 each. The Find Your Voice center will soon be offering workshops to sick, healthy and disadvantaged kids. Through our coaching, they improve communication skills and self esteem, while having fun putting together radio and TV programs. We then share their messages on our media platforms.